Is winter a cold season? What is the weather like in autumn? What kind of clothes do you wear in summer? Can you wear the same clothes in winter? Second graders will learn to answer all those questions and more with thorough knowledge of the four seasons of the year. 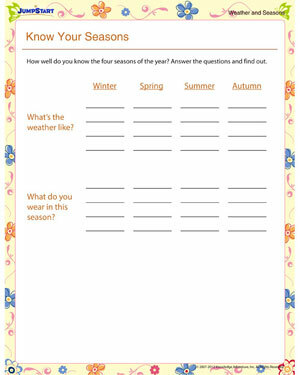 Use JumpStart’s ‘Know Your Seasons’ - a fun weather and seasons worksheet – to teach them more about the seasons. Want more such seasons worksheets? Check them out here!